LZZG sand washing plant is a new type of sand washing and muddy water treatment system developed on the basis of traditional “water collection sedimentation + pretreatment + artificial precipitation + mechanical dewatering” wastewater treatment process. In the traditional sludge treatment process, the water-collecting sediment mainly refers to natural sedimentation, while the artificial sedimentation refers to flocculation and sedimentation. 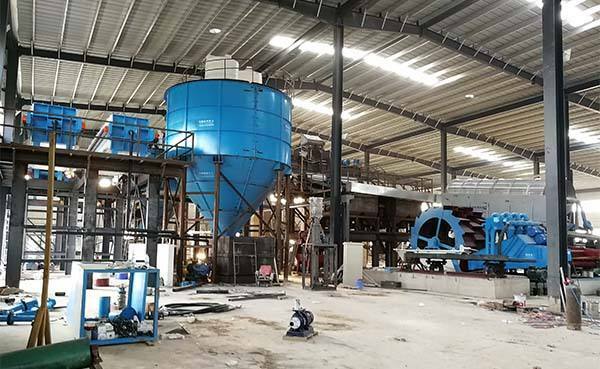 The muddy water discharged from sand washing process pretreated by de-sanding, dewatering and separated to mud and water by adding flocculation, then the filter press is used for sludge dry discharge treatment. 1. The main purpose of preliminary water collection sedimentation and pretreatment section is to quickly remove the larger particles in muddy water and recover the fine sand and stone powder. This can effectively reduce the operating load of muddy water treatment system, prolong the service life of filter cloth and slurry pump, and reduce the input and operating costs of equipment. 2. In the artificial precipitation step, muddy water after the flocculation reaction and precipitate, the sedimented mud is concentrated into the collecting bucket in the center of sedimentation tank by sludge discharging device in time to facilitate the extraction and dehydration. 3. Since the cost of flocculation and sedimentation and the operating cost of equipment are relatively high, the overall cost of the treatment process needs to be considered when implementing the treatment process; if the demand for operating costs such as pharmaceuticals is to be reduced, it is necessary to scientifically set up the water collection and sedimentation process. Setting a larger volume of water-collecting sedimentation tank can effectively reduce the subsequent cost. The shortage is that there is a large enough open space at the production site. 1. Compared with traditional process, LZZG muddy water treatment can not only realize the reusing of clean water, but also effectively recovery the fine sand and stone powder lost in washing and separation process, to improve the grading of finished sand, as well as carrying out dry discharge treatment of sludge, so as to facilitate the transportation and disposal of sludge. 2. Abandoned the flocculation tank that used in the past and requires a large area, Longzhong muddy water treatment is used to effectively shorten the sedimentation time of muddy water through the integrated dosing and centrifugation separation system equipped with the equipment. And solves the problem of squashing and plugging in the mud sedimentation process, and greatly saves the sludge concentration time, reduces cost and improves the efficiency. 3. The system configured filter press can effectively overcome the problems of traditional dewatering machinery, such as dehydration duration, ineffective effect, low degree of automation, incontinuous operation, etc. At the same time, it has higher processing efficiency and runs automatically all the time without manual operation. In addition, the backwashing and pretreatment system specially designed for muddy water treatment system can effectively solve the problems of mud compaction, mud discharge and pipeline blockage in the traditional sewage treatment process. The recycled clean water quality can fully satisfy the aggregate production.